Acupuncture is an essential component in the treatment of all pain conditions. Below you will find a list of pain conditions that I have had success treating. But acupuncture is also very valuable in the treatment of Internal Medicine complains, because it affects both the nervous system and the endocrine system directly, as well as neurotransmitters in the brain. For example, in the treatment of digestive disorders like GERD, or gastritis, or chronic constipation, if you refer to recent research on the “Gut Brain Connection” see Scientific American Gut-Brain Connection Article you will get a glimpse of how acupuncture can help your digestive disorder. Acupuncture is physical medicine, like Physical Therapy, Chiropractic and Massage. Acupuncture has been demonstrated to have very specific anti-inflammatory properties. The insertion of the fine, hairlike acupuncture needle into the body draws out inflammation from the local tissues around the needle by “de-polarizing” the inflamed tissue. That is, the needle has the opposite electrical charge as the inflamed tissue. 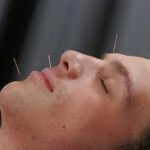 At the same time acupuncture stimulate the body’s secretion of cortisol from the adrenal glands into the blood stream. Cortisol is the body’s most powerful antiinflammatory, its own natural Cortisone. This reduces inflammation throughout the body. Acupuncture also causes the secretion of Endorphins, the body’s own opiate-like neurotransmitters. These help break the pain cycle, allowing muscles which have tightened up in response to pain to now relax. A major component of many pain conditions are tight “hypertonic” muscles. This is the body’s natural, though counterproductive response to pain and inflammation. Placing needles in hypertonic muscles causes them to relax, allowing for increased blood circulation and pain relief. that, when activated due to stress or mechanical factors like repetitive use or lifting a weight with a sudden jerky movement, refer pain through the body. Trigger points are the cause of about half of headache and body pains. Trigger points are effectively “deactivated” by the insertion of acupuncture needles. Acupuncture treats far more than pain, however. In Chinese medicine, the energetic blueprint for disease is stagnation of Qi (a kind of bioelectricalmagnetic energy) that under ideal conditions flows unhindered through the 16 major channels or meridians in the body. The beginning point for the creation of a diseased state is when the flow of Qi through its specific pathways (the channels) is obstructed. In the case of a uterine fibroid, for example, before there was a fibroid there was an obstruction of the qi-energy that should normally flow freely through the three channels that flow through the uterus. Due to unmitigated stress, chronic menstrual blood stagnation, attack of cold into the uterus, creation of excess heat in the uterus due to emotional factors, or due to a congenital abnormality, the free-flow of qi through the uterus was obstructed. This led to an obstruction of the blood (a denser form of qi) and then of fluids and other tissue until finally a fibroid was formed. The treatment of disease with Acupuncture then, is based upon opening the flow of qi through the channels. This is like allowing more water to flow into an irrigation channel in order to remove a blockage created by mud, grass and debris. This is what the placement of acupuncture needles into the proper locations on the channels does. It stimulates and unblocks the flow of qi, so that over time the pathological, disease and pain causing stagnation of substance, whether blood, fluid, heat or cold, will follow. This is the basic mechanism by which we use acupuncture to treat so many diseases. If the qi obstruction is allowed to fester over the long term, then the whole body becomes fundamentally imbalanced. The hands and feet, which should be warm, become cold, the head which should be cool becomes hot, the digestive tract becomes inflamed, the mind can’t stop working at night, etc, etc. Where things should be relatively dry, they become damp (yeast infections, respiratory infections, digestive disorders), where they should be moist, they become dry (insomnia, psoriasis, tendonitis, menopause). Respiratory: Asthma, sinusitis, bronchitis, allergies, common cold and flu, smoking cessation. Gynecological: Premenstrual syndrome, menopausal syndrome, menstraul pain and dysfunction, fibroids, cysts, endometriosis, menstrual migraine. Genito-urinary and Reproductive: impotence, low libido, excess libido, prostatis, bladder infections, yeast infections. Psychological: Anxiety, panic attack, depression, mania, eating disorders; anorexia, bulimia, overeating, addictions and substance cessation. -Male Patient, Sciatic Pain and Back Pain treated with Dry Needling and Chinese Herbal Medicine. Male, 51, Computer Programmer, Chronic Neck and Shoulder Pain treated with Dry Needling and Acupuncture. “I love this guy. He is educated, knowledgeable familiar with both Eastern and Western medicine, fun and interesting to talk to, and most critical of all, was able to help heal my problem: a painful, stiff neck that had been unhealed for over 7 weeks (from a headstand in yoga). I was very concerned that I’d have to go to a “regular” doctor and get x-rays, cortisone injections, maybe surgery…After realizing a beach area community acupuncture clinic did not inspire confidence or provide real relief for what I thought was a “pinched nerve” – I realized I needed someone with a more in-depth and experienced approach. I found Eyton. … he educated me about what was likely happening in my neck, and helped heal the problem with his very precisely targeted needles. There’s no point in saving money if your reason for going isn’t addressed. He was also convenient to where I live, being just south of Balboa Park area. As a bonus, he has an interest in herbs and can recommend various teas, herbs and herbal supplements. “A few years back I had a weird affliction. My tongue was swollen for no apparent reason, for two weeks. I went to an allergist, a dentist, a dermatologist and my regular doctor and no one could figure out why my dang tongue was swollen. My sister, a regular patient of Eyton, recommended I check him out. Never having tried acupuncture before and already sick of trying to figure out what was wrong with my tongue, I was wary but went ahead and made an appointment with him.Of one the first things Eyton said to me was “The tongue is the flower of the heart,” and I knew I had met someone I would get along with, a poetic and gentle soul. He was attentive and gentle with the needles, explaining to me at each point what he was doing and why. I was sooo relaxed. After my first session my tongue returned to normal size. (HA! There is a sentence that is rarely ever written!) I slept better than I had in weeks and knew I had found someone to make a part of my life in terms of health and physical maintenance. Male Patient, Sciatic Pain and Back Pain treated with Dry Needling and Chinese Herbal Medicine. “What a wonderful acupuncturist and herbalist. I felt like this was the first time i went to a Dr. who took the time to really see what my problems were.I first went to Eyton for my shoulder pain, which was gone really quickly. Male, 28, U.S. Navy, Disc Pain, Low Back Pain, Sciatic Pain, and Shoulder Pain, treated with Dry Needling. Thanks for checking up on us, Dr. Shalom. I actually went into labor in the car on the way home from the acupuncture treatment. We went to the hospital an hour later, and I had a really easy labor. Our daughter was born within a couple of hours. Thanks so much, I felt so much more relaxed after the treatment. Eyton I can’t thank you enough for getting me back to normal in just three weeks when the Physical Therapist said it could take a year. For your future patients: I had heat stroke 3 months ago during my BUDS training. My temperature was 106 degrees. I could have, of course, died. Nine weeks later (three weeks ago) I still had blurry vision, dizziness, mental fog, did not feel like myself, and felt like my brain was bouncing around in fluid when I exercised. I had what I can only describe as a band of fuzziness around my head, like a headache. Rapid movement of my head made me feel as I were hungover. I also still was very intolerant of heat, I could not exercise outdoors at all. I also sweat like a pig with the slightest bit of exercise. I felt constantly dehydrated, even though I was not, and would be totally drenched with just 30 sit ups and 30 push ups, and also exhausted. After the first acupuncture treatment I already felt like the blurry vision was gone, and 90% less conscious of my brain in my head, and basically like I was on the way to my old self again. Now, after the fourth treatment, the changes in my diet you suggested, and 3 weeks of American Ginseng, Cordyceps, and the other Chinese Herb formula you prescribed, my sweating is back to normal, actually the P.T. did a test and my sweating is better than normal, my heat tolerance is normal, I have begun exercising again out doors in the sun, my headaches are totally gone, I have no issues to speak of really, have been training really hard to get back into the mix. I am very grateful to you, and have my old optimism back about fulfilling my lifelong dream. Holy crap! These things work. It says two pills three times a day, I was just doing 1 pill three times a day. I noticed within a day….less to almost no pain. That is huge since I would normally be bed ridden or have to take 800-1000mg of Ibprofen. Wanted to share. Thank you! “Eyton, the vertigo is 95% better, the nausea is gone completely, my sleep is good now, and so is the constipation. The sternum feels ok, and driving is easier. Still a tiny bit of vertigo if i look too quickly over my shoulder, like changing lanes. I look forward to our next appointment so we can tame this beast the rest of the way. Thanks for all your help so far. Joanne, 29, Attorney, Vertigo and Shoulder Pain treated with Classical Chinese Acupuncture, Dry Needling, and Cupping. No Herbs. “…thanks Eyton for all your help. The shoulder feels great, all the pain and tightness is gone, and I feel like like I am throwing with power again. Amazing. Wish I had tried this when I was younger. I like the exercises you showed me too. Saw huge improvements in shoulder mobility and range of motion yesterday. Did 20 dips in a row completely pain free which is a first in over a year. I’ll be out of town the next week or so but will be in touch when I get back to get another session in. Thanks for the help! Eyton Shalom helped my friend with her acne and PMS, so I thought why not try it and see how it goes? My skin was so bad it was painful, inflammed, with some really deep zits and lots of whiteheads. Eyton explained to me carefully about my diet and put me on a detox regimen. I had two acupuncture treatments in quick succession and started taking my Chinese and Ayuvedic herbs for Acne, and began using the Ayurvedic masks Eyton recommended, with some tea tree oil and turmeric. I am so excited. My skin calmed down right away and felt way less pain and heat. Within about 3 weeks the whiteheads were about 80 percent better and the cysts gone. Now its about 2 months; my skin is not yet perfect, but it is about 85% better. I have, with Eyton’s help, begun to notice the link between my flareups and how I am doing emotionally. I am pretty excited; my skin has been like this since I was 13…. “Recently, I started having these severe migraine headaches. I tried all the pain killers and headache medicine and it wouldn’t go away for a week. After self diagnoses and research I figured out it was a Cluster headache that was triggered. One day it was so extreme, that I need to see an acupuncturist. I found Eyton, and a appointment was scheduled that same day. After we discussed what was going on, he started his work. He was professional, friendly and most of all listened and inquired regarding my lifestyle. Female, 27, Graphic Artist, treated with Classical Chinese Herbal Medicine, Dietary Therapy, and Acupuncture for Knee pain, Hormonal Acne, Eczema, and IBS. I began my healing journey with Eyton Shalom for the treatment of an acute knee injury. I had dislocated my patella playing soccer and my knee was in pretty bad shape. His acupuncture treatments were highly effective in reducing inflammation and minimizing pain during the rehab process. While my knee was healing, I began to work with Eyton on some longer term chronic health issues as well. He has treated me for irritable bowel syndrome, helping to improve my digestion with a combination of acupuncture, Chinese medicine/herbs and Ayurveda, including nutrition advice and supplements. His treatments have also helped to minimize my anxiety, balance my hormones (he’s a lifesaver when I’ve been struggling with PMS), and reduce skin inflammation including acne and eczema. I’ve been to a number of acupuncturists and herbalists over the past 15 years, and what I love about Eyton (and what keeps me coming back month after month!) is his expertise in a combination of holistic approaches and his kindness in care. He is genuinely interested in my health and well-being, and every treatment is catered to my exact needs at that day in time. I always leave his office feeling rejuvenated, balanced and relaxed, and the long term benefits of my treatments with him are quite evident. My skin has never looked more radiant and my digestion is the best it has been in years. I recommend you visit Eyton for any health challenge you need support with – he’ll know exact the right combination of treatments to support your whole body healing. I wanted to follow up and let you know that I have completed the herbal supplements program. I have seen a drastic improvement in my body, I have lost over 35lbs, my blood, overall health and body feels clean and pure…. I will follow up with you about the acupuncture treatment soon. “Most impressively, I’ve never had a health professional ask me so many questions about my medical history as Eyton Shalom did. Instead of having to complete a generic form, I dictated my answers while he wrote them down. He explained the pertinence of the questions and how it tied into Natural Healing and Chinese Medicine. The main reason for my visit was because of eczema, something I’ve had on my hands for over 20 years. Eyton explained to me how, in Chinese medicine, the digestive system and lungs directly affect the skin. Besides providing acupuncture and Ayurvedic therapy, he sent me a special handout on eczema via email (which expressed how he thought about me after our visit). Throughout the entire visit, Dr. Shalom made sure I didn’t have any questions and insured that I was most comfortable, especially since this was my first acupuncture session. Within just one week, I was elated to see how quickly my hands started improving in both texture and appearance. I’ve since seen the doctor for typical work-related tension and stress in my hands and shoulders. I couldn’t believe the relief I felt instantly after the acupuncture treatment (something hour-long sessions of deep tissue massage could not even compare to). “…I am so pleased with the progress my daughter is making with your treatment. My whole family loves the Emperors Calming tea you have suggested for Andrea. Her mood is much improved and her destructive behaviors have lessened quite a bit. Thanks so much! “I was introduced to Eyton several years ago by a friend following a minor automobile accident for whiplash treatment. Since then, Eyton has gone on to treat me for minor aches and pains, including chronic neck pain and a minor bout with carpal tunnel syndrome. It’s amazing, after a needling treatment that the pain is like magically gone afterwards. I have found Eyton to be very patient and a wonderful acupuncturist. His knowledge of Ayurvedic medicine has been very helpful for me too. The Chinese herb combination that he has recommended for me has helped take control of an irritating dry patchy skin condition which I am very grateful for (because it used to itch itself raw). “I recently had some extreme back pain and leg pain which the doctor said was my sciatic nerve. Not having health insurance, and not wanting to take the shot in the spine that halts the pain, a friend who suffered from extreme migraines and hip pain, recommended, Mr. Shalom to me. My sinus pressure is gone and my sinus’ have been draining like crazy. I don’t know if it has to do with the magnesium pills or the points you worked on last night but I feel a whole lot better. Eyton Shalom cured my hives. About a year ago I developed a severe case of hives. It is safe to say that on my worst days about 60% of my body was covered with large welts that itched intensely. In time my body became immune to the prescription medications and they no longer provided any relief, I was also worried about the potential harm these medications might cause my liver. I’m sure you can imagine I was suffering both physically as well as mentally. Incidentally, about this same time I herniated my disc while exercising. I ended up in ER, was given pain pills and began physical therapy which I did not believe was helping at all. Eyton carefully explained exactly what was happening to my body. Regarding the hives he told me that I had an extreme heat condition. This sounded reasonable because not only did my hives itch intensely but they were in fact hot. By my second treatment the hives began to subside, also I felt more peaceful. I have not had a single outbreak of hives in several months. Eyton is also treating me for my sciatica and I am happy to say that I am once again hiking and working out at the gym. There are gifted acupuncturists and ones that have no effect. Eyton is the best. I started seeing him for ulcerative colitis. Kaiser wanted to remove my colon and instead I saw Eyton and after some time it went away. I’ve since seen him for many other ailments and he is always helpful, caring, and knowledgeable. “I am extremely grateful for your help. My acne has completely cleared up, which was an amazing transformation! And the fact that you truly listened to me and my concerns was so refreshing compared to most interactions I’ve had with other “professionals” the health industry. That said, I will definitely reach out if I have any acute injuries or other maladies. And I will certainly send anyone I know looking for acupuncture and Chinese medicine your way. Thank you so so much for being so kind and listening to me when I needed it most! Moxibustion and Cupping are common treatments used to relieve all kinds of muscular and fascial pains, such as you see in arthritis, neck, shoulder, forearm, upper and lower back pain. But heat also “moves the qi,” and the moxa leaves being spicy, have a very “yang” nature, so that they can also strongly open channels, especially when blocked by cold, and relieve pain caused by Qi and blood stasis,Cold and Dampness. It is also used to warm the Uterus in cases of pain due to cold and blood stasis. Asthma, Diarrhea, Rheumatic pain, abdominal pain, vomiting, certain Gynecological disorders, any kind of pain due to cold or deficiency and deficient organ function are some of the main disorders treated with Moxa. In Chinese Medicine moxa-bustion is especially popular in fall and winter, when it is used to warm the channels and strengthen the organ complexes, especially the Adrenal-Digestive axis (Kidney-Spleen). In fact, it is so much a part of our work, that in Chinese, Acupuncturists are actually called Acupuncture-Moxabustionists. There are hundreds of varieties of moxa. One is the stick type you can get at any Chinese Herb shop. It is easy to do at home and I often recommend you incorporate it as part of your self-help program. 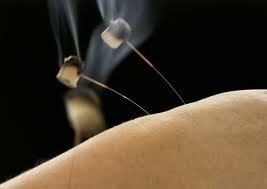 What you do is light a moxabustion stick and hold it close enough to your skin so as to feel heat without burning. Do this at the locations Zu San Li, San Yin Jiao, Qi Hai and Zhong Wan. Have someone else do it at the space between your physical Kidneys around the 2nd Lumbar vertabrae. What I do in my acupuncture practice here in San Diego is show people the locations, so they can do it at home, first thing in the morning, once or twice a weak. Acupuncture “points” are actually caves. They are depressions in the surface of the body where the Qi of the channels is easily influenced. The idea is to warm these spaces gradually and deeply; moxa-bustion should feel pleasant, even wonderful. Regular moxabustion (once a fortnight) before and during the winter season will prevent colds and remedy arthritic and other types of pains. In most circumstances application of moxa is beneficial anywhere there is pain. Please check with a licensed practitioner first, before usiing Moxa at home for any condition, however. Cupping is a method of treating disease that is caused by local congestion. A partial vacuum is created in a cupping jar, usually by means of heat, which is then applied directly to the skin. The underlying tissue is drawn up into the jar forming an area of blood stasis. This appears to bruise the area, or at least turn it a bright red. The amount of dark red or even purple blood drawn to the surface indicates the degree of stagnation. Dark blood is a sign of stagnation, which in many cases in modern terms is the amount of toxins in the blood. There are some pictures of cupping in the slide show on my home page. I like to use cupping to relieve all kinds of muscular and fascial pains, such as you see in arthritis, neck, shoulder, forearm, upper and lower back pain. It is great for all kinds of sports injuries from sprains to tendinitis. I often combine cupping with the application of Chinese Herbal Liniments which come from the Chinese Martial Arts traditions. These are called Dit Dat Jiao, and are a very affective way to increase blood circulation to an area and reduce inflammation and draw toxins like lactic acid out of the tissues. Acupuncture is best done when a person is not hungry, and has also not just eaten. If you are coming after work, and very hungry, please have a light snack. Preparing for your acupuncture appointment will help you get the most from your treatment. Please try not to use anything with fragrances on your treatment day. Definitely do not put on any perfume immediately before your appointment. There are two reasons for this. First, part of Chinese and Ayurvedic medicine diagnosis is to notice a particular body odor. Don’t worry, its OK. I am a doctor and used to people’s smell. Second, some of my patients are chemically sensitive, and can have allergic reactions to perfumes and perfumed products, even if they seem “all natural.” Commerical perfumes are actually quite unhealthy, containing petroleum by-products called Pthalates, which disrupt endocrine systems, among other problems.. Perfume companies also include chemical fixatives in their product to make them last longer on your body; the problem is these same fixatives cause the perfumes to remain in a room long after you leave. Thank you so much for understanding. As I see one person at a time, it is not necessary to come early for your appointment. Just being on time is perfect. Your time has been reserved for you and you alone. Please give at least 24 hours notice if you need to reschedule so as to avoid charges for an office visit. Thank you for understanding. There will be a tiny intake form when you come in. I prefer to get all additional information through questioning. But if you would like to answer the following questions and print them out or paste them into an email, that will give us a head start, and get you thinking about the kinds of questions you may be asked.Please answer the following questions briefly. If in doubt give more, rather than less detail. Thank you. What treatments have you had so far, of any type? Did any of them help at all? Is there anything that you do at home that makes it better, anything that makes it worse? Sleep: Do you have any trouble falling or staying asleep? Do you feel refreshed in the morning? Appetite: Strong, Weak, Excessive? Can you eat anything or are you a fussy eater? Do you feel good after eating? Any indigestion after eating, bloating, belching, heartburn, pain, fatigue? Any diagnoses such as GERD, Gastritis, Ulcer? Bowel movements daily? How many times? If not, how often. Any constipation or diarrhea with stress? Have you had any bladder or kidney infections? If so, how many? Men: Any issues with prostate gland, erectile dysfunction or other urogential problems. Does your period come at regular intervals? Is it regularly about the same number of days? Is the bleeding light, medium, or heavy? How many days are heavy? Do you suffer from any symptoms WITH the bleeding, such as cramps, clots, leg pain, constipation, headache. Do you suffer from any PRE-Menstural symptoms, such as bloating, swollen tender breasts, food cravings, bowel changes, emotional changes such as irritability or crying from things you would not normally cry at? Please be specific. Libido: Would you describe it as high, average, or below average? Body Temp: Do you prefer to be cool or warm. For example,do you like to sleep with a blanket even in warm weather? Are you bundled up when others are not? Do you wear shorts and T shirt when others are warmly dressed? Does hot sun make you feel uncomfortable or headachy? For example, if warm, do you prefer dry heat or moist heat? What kind of climate do you dislike? Feelings: Would you describe yourself as by nature fundamentally happy, sad, angry, worried, fearful, easygoing, pensive? Do any of these occur more predominately or as a recurring theme? How happy with work, friendships, primary relationship? Do you meditate or have a spiritual practice of any kind? Exercise: How often and what kind? Substances: Do you consume coffee, tea, tobacco, alcohol, or any other non-medical drugs? How much and how frequently? Medical drugs: Please list any pharmaceutical drugs, nutritional supplements, or herbal medicines you currently take. Diet: What do you eat? Please give a thumbnail sketch of breakfast, lunch, dinner, snacks, beverages, and favored treats. Are you happy with your diet at this point in time? Here is a list of our patient’s most common queries. If you have any other questions feel free to contact us directly. Acupuncture is the placement of hair-thin needles into various locations in the body. These locations are known as acupuncture points. The ancient Chinese believed that the body was first and foremost a system of energy, what they called Chi, or Qi.They mapped out grids along the body, what they considered pathways of energy, which they called meridians.It was through these meridians that they felt the Qi flowed. The acupuncture points are along these meridians. It was thought that by putting acupuncture needles into these points, the Qi would be stimulated to flow better, and the person’s health would improve. Thousands of years of clinical work have shown that the Chinese were right! After a treatment, especially treatments for certain pain conditions, you may feel a soreness in the muscle, akin to a “post work-out soreness. This goes away in a few hours or 24 at most. If you are sensitive, please let me know. It is always possible to do a very light Japanese style treatment in which you do not feel the needles at all. This is very valuable and perfectly appropriate in many cases. People almost always feel quite nice, as if they have had a deep profound rest, very relaxed, in in much less pain or stress. Somewhat like how you feel after a good massage. Acupuncture, and Chinese Medicine in general, is understood to be a process. It is trying to stimulate the body’s own natural healing capabilities. Some people respond quickly, and others take more time. Common sense would dictate that the longer a person has had a condition, the longer it might take for it to reverse, though every so often, a person with a seemingly intractable problem responds very quickly. You should plan on a course of from three to six to ten treatments to either effect a cure, relieve symptoms totally, or partially. 90% of the time we will see some very positive response before three treatments, and if not, I rarely ask you to continue. What’s the Difference Between a Licensed Acupuncturist and an M.D. That Does Acupuncture? There is a big difference. A licensed acupuncturist has at least 3,000 hours of training in acupuncture and Chinese Medicine, along with courses in Western Medicine, Anatomy, Physiology, etc, and completely understands the levels of sophistication of Chinese Medicine, and is well equipped to treat any problem using Chinese Medicine. A physician that does acupuncture is rarely a licensed acupuncturist, but is certified to practice acupuncture. They undergo 300 hours of training, some of which is done by watching videos. They are generally trained in just the very basics of acupuncture, and sometimes not even that. Having said that, I personally know some M.D.’s with very sophisticated and advanced training in acupuncture, who are very dedicated practitioners that I trust completely. Usually they restrict their practices to pain. They are rarely trained in herbal medicine. Many insurance companies do – it varies from company to company. Check with your carrier to see. Sadly, because of recurrent issues getting paid by the insurance companies, I no longer bill insurance. All payment is made by the patient, and we do give receipts with billing codes for you to attempt reembursement. We DO ACCEPT Health Savings Accounts and Flex Plan Account cards. Also Mastercard and Visa. Thanks very much!